More than 200 peony growers from around the state will gather Jan. 30-31 in Fairbanks for the 2015 Alaska Peony Conference. The theme is "Nurture Alaska's Blooming Peony Industry." The conference is hosted by the Interior Peony Growers and the Arctic Alaska Peonies Cooperative at the Westmark Hotel and Conference Center. Pre-conference sessions are planned for Thursday, Jan. 29, with sessions on income tax issues, a new growers' school, managing risks and an intermediate growers' school. Full days are set for Jan. 30-31, with an awards banquet at 6:30 p.m. Jan. 30. 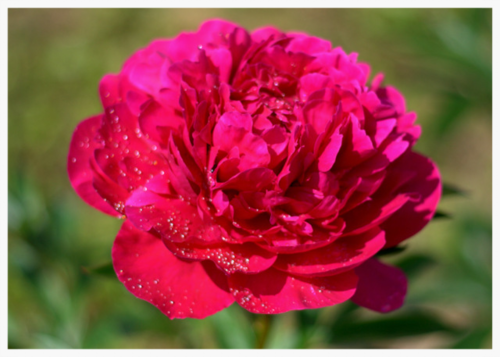 A post-conference session on how to interpret a soils laboratory analysis report will will be taught by SNRE Research Technician Bob Van Veldhuizen Sunday, Feb. 1 from 9 a.m. to 3 p.m.
SNRE researchers will participate in a peony research panel Friday, Jan. 30 from 9:15 to 10 a.m. The conference will cover topics such as farm-based research, understanding insect life cycle, training the workforce, taking soil and leaf samples, organic weed management, choosing and preparing land, ordering peony roots, choosing commercial peonies, farm accounting and taxes, peonies from Europe and more. The conference is $200. Register here.